An hour’s walk through the jungle from the small Rio de Janeiro coastal town of Paraty, an amazingly beautiful and peaceful beach only shared with a few locals and surfers can be found. Far from everything and close to paradise, the Praia do Sono (Sleep Beach, in Portuguese) is home to less than 70 families, including many women who are now working to establish a tradition in embroidery. Supported by Sebrae, the Brazilian service of support for small enterprises, the group “Bordadeiras da Praia do Sono” (“The Embroiderers from Sleep Beach”, in a literal Portuguese translation) made their first foray into embroidery in 2007 with the intention of supplementing the income of their partners, mainly fishermen or builders working in the region. 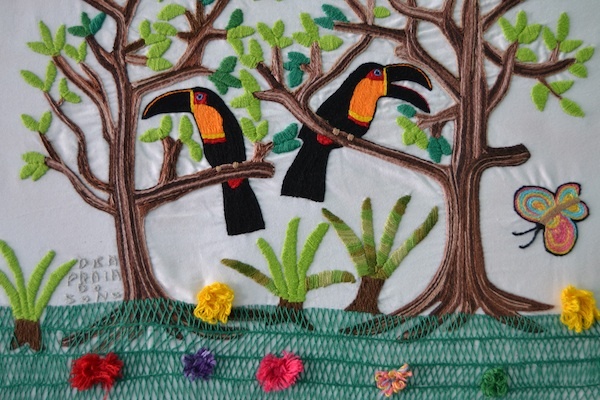 Since then, the embroidery work from this tiny village is now gaining popularity across Brazil for its rustic and original themes, which represent the everyday lives of coastal villagers. Local artists Tiago Alvarenga and Anderson Castro create drawings based on what the artisans want to embroider on any given item. Each piece can take several months to complete and are mostly impossible to reproduce. Nowadays, the Bordadeiras group divides its activities between the actual production of items for sale and the training of new embroiderers within the community. “When our work started back in 2007, many people didn’t think that we could evolve – some of our husbands mocked us and others were more gentle and suggested that we made pieces to decorate our own homes,” says Emily Monteiro Brown, director of the association that represents the artisans and an embroiderer herself. To everyone’s surprise, according to Emily, the first collection of needlework became an exhibition held at the cultural center of Paraty and all the items were sold. “This gave us a massive boost to continue,” she says. The exact origin of the name Praia do Sono is unknown, but locals say that the “Sleep Beach” could have been named by pirates, who arrived at the beach after a long trip and were able to have a peaceful sleep. The second version is that since the beach is surrounded by tall mountains, it dawns later and darkness falls earlier. This post is part of our Craft Tour of Brazil project, where we will visit all of the Brazil looking for the finest craft and the makers from every one of the 27 Brazilian states. Read more about it here.